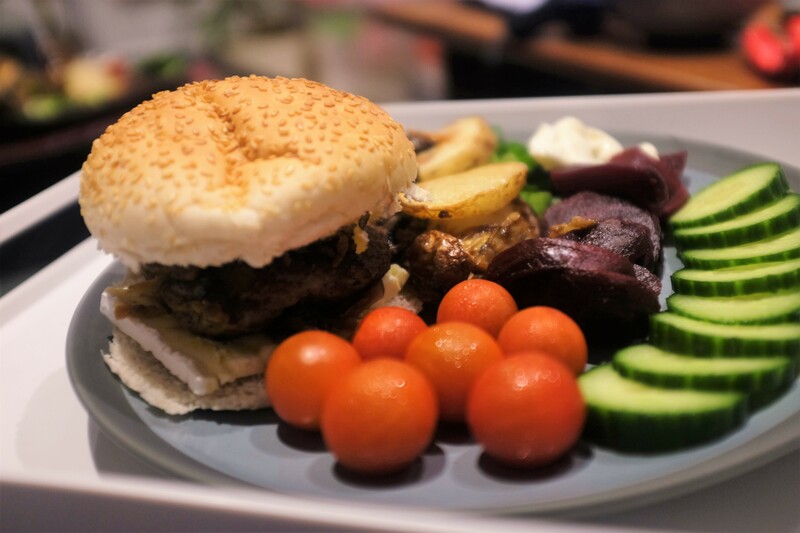 These burgers were possibly the best I ever made and, even though I have eaten many burgers whilst out and about, they compared to very few that have lodged within the memory. 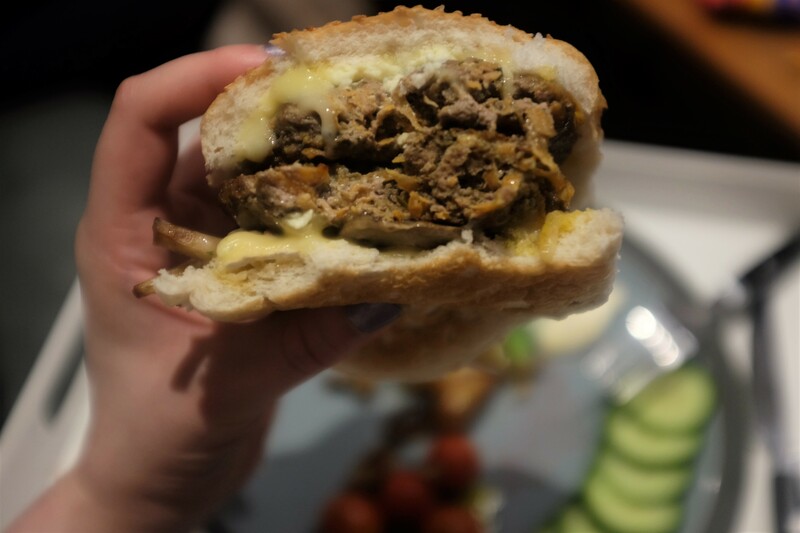 It wasn’t until sitting down to write this post, considering the way the burger was made and how the chips were put together, that it clicked as to what they actually remind me of and in that moment I started to shed a few tears. Crying over a burger, at times I can see why men call us women a bit over-emotional, isn’t it incredible how food and certain cooking processes can spark a particular set of memories. The memories that came to mind with this burger is both a joyful one but also a painful one; there are certain memories that have been ruined by the exposure to truths or others opinions and your mind is torn as it tries to remove the bad and focus on the pureness of the memory and moment itself. I can tell you are interested in what that memory is so let me fill you in. Every now and then, whenever I had the chance and my Grandad was free, I would find myself sitting at my Grandad’s kitchen table for dinner as I was staying the night at his. We used to take the dogs Jack and Bonnie, and then one day just Jack, for walks in the woods that you could get to through the fields just at the back of his garden and then we might go to the park and for a walk by the duck pond before being absolutely exhausted and flopping at the kitchen table but smiling and laughing away. His wife would cook us a real treat of homemade burgers and chips that would come in a little wicker basket with paper at the bottom and the kitchen would smell of the oil spitting out of the chip fryer. It’s the only meal I remember eating at that dining table, though I am sure we had numerous other meals too, but the smiles and laughs as well as the vision of the basket of food remains strongly in my mind. Making burgers rarely happens in the Cooking Up A Treat household but when it does that memory always comes flooding back. Partly the brain lures me towards making them subconsciously to spark the memory in my mind and another part desperately tries to get me to avoid making them so I don’t get launched into dwelling on the past. Still, at least these burgers were tasty and cooked well! 500g pack of mince. We used beef but any sort would work well. Salad, chips, whatever you want to go with them! Put all your grated ingredients, mince, herbs and spices and the beaten egg into a large bowl. This bowl needs to be one you can get your hands into and then also sit somewhere in your fridge. Mix all those ingredients together making sure that it is all evenly combined and that the egg has distributed well across the mixture. Cover the bowl and put the mixture in the fridge for a couple of hours. Take the mixture out the fridge and split it in half. Doing this allowed me to make four burgers with one half and twelve large meatballs with the other half. Form the burgers and put them on a tray, covered, back into the fridge. Make the meatballs and put them into an airtight tub (I split them with layers of cling film to stop them sticking together) for the following day. You can either now cook the burgers on a tray or do them in a large pan on the hob. I tend to do them on the hob at a high heat to seal the burgers and then turning the heat to medium-low and cooking them for an additional 20 minutes or so (obviously check it is cooked properly and is piping hot before you serve). Make sure you carefully flip them occasionally to ensure an even cooking. Doing it this way keeps them moist and does a gentle cooking as well; I always get paranoid about drying them out on the outside but the middle still being a cold raw ball of mince! Serve. I put some cheese at the bottom and top of the bun before stacking them up but obviously go with whatever works for you. When storing the mixture and then the burgers and/or meatballs raw make sure that it isn’t near any cooked meats or products that are open and intended to be eaten raw. Where possible put it on the bottom of the fridge as this stops any raw juices dripping down over other things. Basically please follow basic food hygiene recommendations. If you make these as soon as you purchase the mince you can also seal the mixture and put it into the freezer, shaped or not, so it is ready to go for another time. I find this to be great given the size of the packs of mince, especially the better value ones, and there just being a couple of us in the Cooking Up A Treat household. You can get a huge box of mince, make some burgers and meatballs to freeze and then just freeze the rest of the mince to use in a spag bol down the line; it works out cheaper than buying pre-made ones and saves on food waste too! Once these have been cooked they can be eaten cold. You could reheat them, making sure they are piping hot, but this might dry them out and they will be lacking the same original flavour and texture so would recommend just cooking as much as you need and storing or freezing the rest for future use. What do you love putting into your burger or meatball mixture? This entry was posted in Food and Drink, Recipes and tagged batch cooking, burger recipe, burgers, cheap cooking, comfort cooking, comfort food, eating, fakeaway, food, food blog, food blogger, food bloggers, good grub, home cook, homecook, homecooking, lblog, lblogger, lbloggers, life, Lifestyle, lifestyle blog, lifestyle blogger, lifestyle bloggers, meatball recipes, meatballs, Recipe, simple cooking, tasty, tasty cooking, tasty food, yummy. Bookmark the permalink.